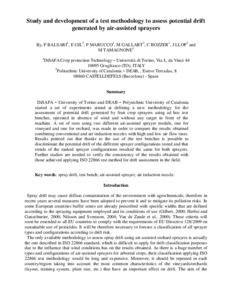 Balsari, Paolo; Gil, E.; Marucco, Paolo; Gallart, M.; Bozzer, C.; Llop, J.; Tamagnone, M.
Balsari, Paolo [et al.]. Study and development of a test methodology to assess potential drift generated by air-assisted sprayers. A: International Advances in Pesticide Application. "Aspects of Applied Biology 122, Internattional Advances in Pesticide Applications". Oxford: 2014, p. 339-346.